Tipperary have ended their ten-year wait for an All-Ireland minor hurling title thanks to a thorough 2-18 to 2-07 beating of treble-hunters Galway at Croke Park this afternoon. Tipp amassed 14 wides but still put in an exhibition of scoring with corner-forwards Pa Bourke (1-07) and Timmy Dalton (1-03) driving them on to claim the victory. Bourke netted a fourth-minute free to raise Tipp's hopes of an upset against the champions – Galway looked far from battle hardened as they had played only two games in advance of the final. The beaten Munster finalists led 1-04 to 0-04 at the break with Galway skipper Joe Canning, who was gunning for an historic third successive winners' medal at this grade, having two frees saved on the line. With their half-back line dominating, Tipp pushed on with Dalton grabbing a 42nd-minute goal, and while substitute Enda Concannon and Eoin Forde picked off goals for Galway, they only served to be consolation strikes. Tipp took time to find their range as they hit seven wides in the opening 13 minutes, and not even Bourke's opportunist goal from a right-sided free seemed to settle their nerves. Galway bounced back from that early setback with Canning and goalkeeper James Skehill, the only two survivors from last year's final win, showing their skills. Skehill rose defiantly to claim a dropping ball near his crossbar while Portumna ace Canning shot over two frees, adding to a Ger Hennelly score, to chop Tipp's lead down to 1-01 to 0-03. However a third Canning free proved to be the champions' last point of the half as scores from Bourke, Dalton and centre forward Thomas McGrath, who burst brilliantly onto a loose ball and arrowed over off his left side, sent them in at the break with a one-goal cushion. However Galway should have been in front at that stage – Canning was left frustrated in the 29th-minute when referee Dominic Connolly called play back for a foul just before the teenage terror rifled the ball to the Tipp net with a stunning ground shot. Canning took the subsequent free, from 20 metres out, but goalkeeper John Ryan and his defenders held firm and swatted the sliotar away. Canning went for goal with another free in injury-time but his shot was repelled once again. Galway boss Mattie Murphy would have emphasised his side's need for a good start to the second half but they got off to an inauspicious one as both Bourke and full-forward Tony Dunne, who played in this year's Junior International Rules series, flighted over early points. The Tribesmen were still very much in the hunt but a burst of 1-04 from Tipp between the 39th and 43rd minutes flattened them. Points from Bourke, Seamus Hennessy and Gearoid Ryan sandwiched Dalton's well-taken goal which saw the Arravale Rovers man dance in along the end line from the left and beat Skehill at his near post. Now 2-10 to 0-06 ahead, Liam Sheedy's side were looking comfortable. A sudden Galway goal, which saw Concannon net with a deflected shot after Canning’s well-timed pass, rallied the boys from the west. Yet they never truly looked like coming back, especially with Tipp’s half backs in such a mean mood. Midfielder Forde's 56th-minute goal at the Canal End – a neat kicked finish after Canning had put the heat on the Tipp full-back line – was utterly meaningless as the winners had managed to rip over six points in the previous ten minutes. Points followed from Bourke (free), substitute Michael Gleeson and Canning (free) in the closing minutes as Connolly's final whistle sparked wild celebrations from Tipp captain Joey McLoughney and his team-mates. Speaking in the aftermath, Tipp boss Sheedy said: 'We’re just delighted. I've had the players since February and their commitment has been absolutely magnificent – they came in training during the exam period. '(After the Munster final defeat to Cork) some people doubted this team's character but they showed them today. 'A Tipp team hadn't beaten Kilkenny in the minor championship for 30 years so (the semi-final win) that was a massive monkey off our backs. 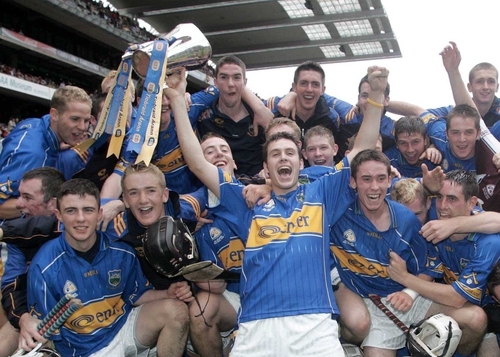 TIPPERARY: J Ryan; M Cahill, P Maher, B Maher; E Hogan, T Stapleton, J O’Keeffe; J McLoughney (capt), G Ryan (0-01); S Hennessy (0-02), T McGrath (0-02), N Bergin; P Bourke (1-07 (1-04f)), T Dunne (0-01), T Dalton (1-03). GALWAY: J Skehill; J Ryan, M McMahon, A Moylan; D Burke, K Keane, S Quinn; E Forde (1-00), G Lally; A Harte, M Corcoran, L Tully; S Coen, J Canning (capt) (0-05 (5f)), G Hennelly (0-02).